Police officers and the Mothers Against Drunk Driving coordinator educate motorists about the hazards of driving under the influence of alcohol and drugs at a DUI checkpoint in Hilo on Thursday. Big Island police are informing motorists that officers will conduct DUI checkpoints throughout the island over the holiday weekend. The effort is part of a national and statewide campaign called “Drunk Driving: Over the Limit. Under Arrest.” Traffic Safety Coordinator Dieter Blattler said police are reminding motorist of the consequences of impaired driving. Officers from the Traffic Enforcement Unit, personnel from the Traffic Services Section and the Big Island Mothers Against Drunk Driving coordinator conducted a DUI checkpoint Thursday (September 2) in Hilo. Police and MADD Program Coordinator Lisa Onorato reminded motorists about the hazards of drinking and driving and gave them literature on the subject. 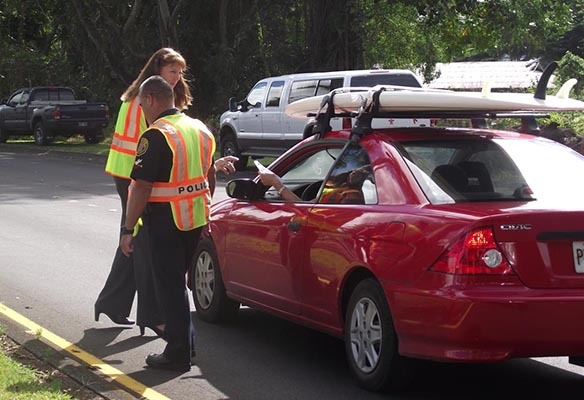 The checkpoints kicked off Labor Day weekend enforcement efforts on the Big Island. 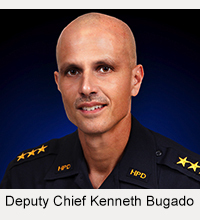 In 2009, Hawai’i County had three fatal traffic accidents over the Labor Day weekend, resulting in five deaths. In two of the three accidents, alcohol was a contributing factor. 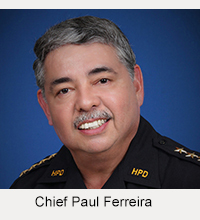 This year, the County of Hawai’i already has had 20 traffic fatalities, compared with 14 last year. More than half of this year’s traffic deaths were alcohol or drug related.